The one thing I’m learning really quickly is that with such a limited ration of protein available, you definitely need to be organised to eat a wartime diet! Not like these days when you just dip into your freezer and nuke dinner on a whim. Today’s breakfast and lunch were much as yesterday, so no pictures for those. However, I did add some chips/fries to my lunch as I met with a friend to go to a movie (the pictures!) this afternoon and knew I wouldn’t be home till late. Dinner was supposed to be Woolton Pie – a dish created during the war – but wouldn’t you know it, I didn’t have the right veggies in. 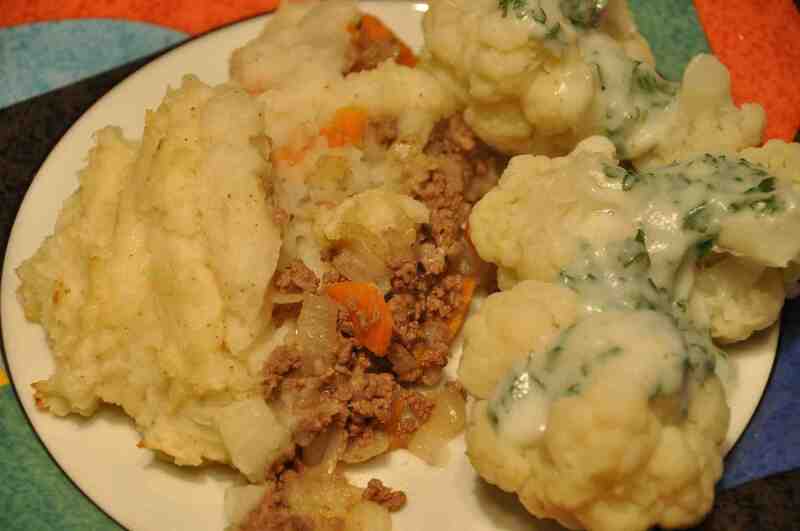 So, it was soup from yesterday, followed by cottage pie and cauliflower with parsley sauce. It looks a bit pallid in the picture, but tasted good, so with plenty pie left over for tomorrow, I’ll need to come up with more colourful vegetables to make it look a little more appetising. Some conflicting memories of a particular wartime experience now, and for the fiction writers out there, an important lesson in age appropriate characterization. Although they spent most of the war in the countryside, my Mum, Anne (who was 12 years younger than my mother) and my brother were in Glasgow during the Clydebank Blitz. According to Wikipedia, over two nights, 528 people died, 617 were seriously injured and hundreds more injured by blast debris. Out of approximately 12,000 houses, only 7 remained undamaged, with 4,000 completely destroyed and 4,500 severely damaged. Over 35,000 people were made homeless. My grandparents lived in a flat in Byres Road. During those horrific raids, my grandmother pulled all the mattresses into the hallway – well away from the windows – for the family to sleep on. If they were going to be killed, Mum said, they were going to die together. It always brings me to the verge of tears when I think of that; my grandmother facing the possible loss of her whole family and my mum being unable to protect her infant son. I can’t imagine the horror. That’s an adult account of that experience. Now here’s Anne’s . A couple of years ago I was invited by the local junior school to talk to groups of children about wartime, and got many, probably enforced, thank you letters from them. From these it was obvious that the bit they liked was when I confessed that during the Clydebank Blitzes (I was about 11/12) we had all gathered in the ‘safest’ place in the house but I several times made an excuse to go to the bathroom so that I could see the searchlights and the glow of the fires. Oh, the wondrous resilience and fearlessness of youth! If you have any stories of the war, I would love to hear them. This entry was posted in Uncategorized and tagged Byres Road, characterization, Clydebank Blitz, Diana Cranstoun, Glasgow, wartime memories, wartime rations. Bookmark the permalink.